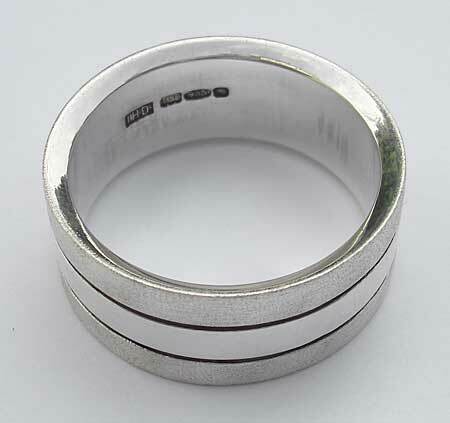 Men's Twin Finish Silver Wedding Ring : LOVE2HAVE in the UK! 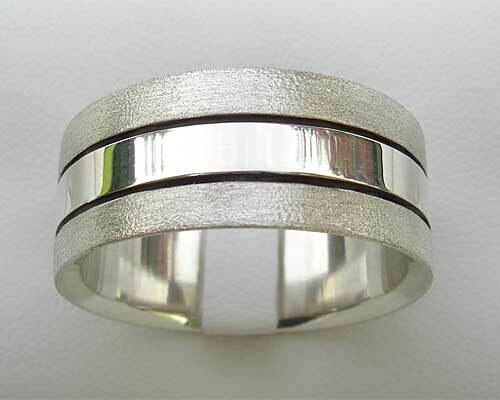 A beautiful wide silver wedding ring for men with a two-tone or twin finish. The ring comprises of three sections as you can see. Width wise they are all equal. The two outer sections come finished with a frosted texture, and the central in a polished finish. Two thick black etched grooves split these sections. Finally, the wall has an inward facing profile. The wider 10mm ring is quite a substantial piece and is indeed suitable for a men's wedding ring, but it is also available in 8mm for those unsure about wearing such a wide width. Width(s) Available: 8mm - 10mm.